One of the enjoyable side effects of art collecting is artist collecting. Gail and I are fortunate to know many of the artists who create the works we enjoy, and Tuppy Lawson is high on that list. Her real name is Antonia, and I have no idea how you get from Antonia to Tuppy. She was born in Hong Kong, educated in England, France and Taiwan. Speaks English, French and Mandarin. Has fun in Chinese restaurants since the waiters never think she can understand what they say to each other. 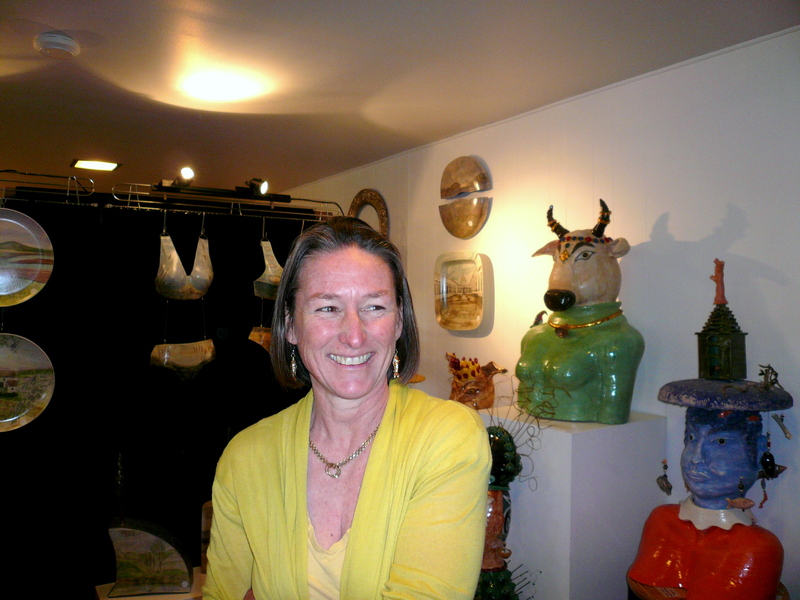 Tuppy is from a family of artists–her mother and two sisters are all working artists. She lives in San Rafael with husband Alex (a Maserati salesman, but he can’t get me a demo to try out for a week or so), has one daughter just graduating Stanford and another just starting UC Santa Barbara. When she’s not creating whimsical art she’s a top selling wizard at the Corte Madera Apple store. Consistency is a virtue in a CPA, it’s death to an artist. Notice how Tuppy has figurative work, surrealistic figures, her bikini series, decanters and hearts. Creativity bubbles out of her like ash out of an Icelandic volcano. She recently fired a piece too early, and needed to add “something”. Although she had never painted in her life (not caring to be competitive with her very accomplished mother), she picked up a brush and started–now she loves painting her creations as well. We were visiting because this was Open Studios weekend in Marin, but she will be at the Ruth Bancroft Garden sculpture show Fathers Day weekend, too. Be sure to see her there. This art is really great.